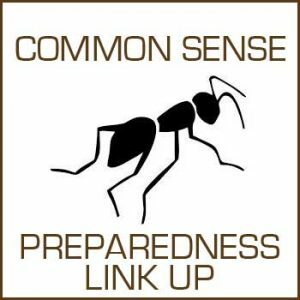 My husband and I are working on a book titled Common Sense Preparedness. There's been quite a bit of attention given to extreme prepping (like the folks in the Doomsday Preppers show), but much less publicity given to everyday emergencies that are much more likely (see Odds of Everyday Emergencies) such as illness, injury and exposure to toxic substances. This book is intended as a preparation guide for people busy living their lives. I'll be sharing excerpts from the book as we work on it, and to encourage you to start thinking about preparedness, I'm also going to be hosting a weekly preparedness link up. Insurance protects you from unexpected events. A small stock of food and supplies pays you when you need it unexpectedly. Having a generator when there isn’t one for 300 miles is priceless. A good water filter when you are up to your knees in contaminated flood water will keep you drinking safe filtered water. Buying things in bulk and when they are on sale and stockpiling at least a small amount will end up saving you money and giving you a safety cushion. Do some minor stockpiling of dry goods and canned food. That small stock will help you through a storm or unemployment, protecting you and your loved ones. The stock of food provides a level of “insurance” for other surprises such as you or your loved ones losing their job, or even a simple snowstorm when your refrigerator is nearly empty. If you have a stockpile it’s a lot easier to live through those smaller events and even bigger events like unemployment. Shop for items that are made to last. Balance investment in items with investment in yourself. Learning skills is as valuable as having stuff. Once you learn something it is yours forever. 1. This is a preparedness link up for those who want to be more self-sufficient. We welcome posts on growing/raising/hunting food and food storage, self-reliance skills, home remedies, wildcrafting, building and repairing, emergency medicine and all things prepping. Just use the link up tool below to enter your post. Please link directly to the relevant post, not your blog's main page. 2. Please link back to this post from your featured content. You may use the image at the top of the post as part of your link if you would like to do so. 3. Keep it clean, skip the ads. This is a PG-13 site, and I want to feature prepping posts, not ads and giveaways. Each week I'll be adding my favorite posts to the Common Sense Preparedness board on Pinterest. 4. Leave a comment if you'd like to share a little more information about your post and/or any preparing you're currently working on. If you are reading this post via email, click through to join in or visit this week's links. Don't forget to check out the Preparedness page for a list of articles already on the website. Great idea for a link up Laurie! I love this idea! I shared my recipes for homemade coconut oil arnica salves. I could not find an arnica salve that didn’t contain some sort of petroleum product, so I made my own. 🙂 Thanks for hosting! Thanks for hosting! Your book sounds great – I can’t wait until you have it available! Our Family has found that my Beat the Flu-Elderberry syrup recipe has not only been great for flu prevention but it has been helping with allergies now that spring has sprung. I also like that the kids love it and take it without a problem. I love that you and your husband and writing such a practical book can’t wait to read it. This is a great idea! Thank you so much for hosting. Great blog hop! Thank you. Thanks for hosting this! Such a great post, I also believe that we have to be prepared at all times, that’s why whenever I plan, I always have a plan B just in case the first one won’t work. I can’t wait for the book to be available.